Kendall SCD 5489 Large Sleeve is a single patient use leg garment for use with the SCD Sequential Compression Systems (controllers 5325, 6325, and 7325). 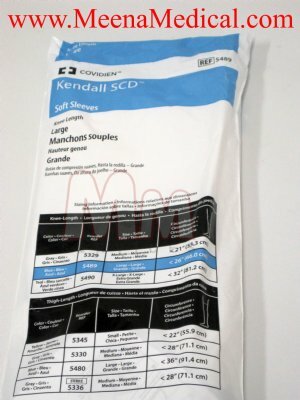 The sleeve contains three bladders to deliver circumferential, sequential and gradient compression to ensure clearance of the deep veins without the risk of distal blood trapping. The sleeves are knee length and are packaged in pairs. Three independent, sequential bladders: ensures clearance of deep veins without the risk of distal trapping of blood. Circumferential bladder design: ensures the collapsing of valve cusps and promotes complete emptying of the veins. Anatomical design: provides customized fit for varying patient leg shapes and sizes. Three-flap closure with hook & loop attachment: provides customized fit and allows for easy adjustments. Soft inner and outer lining: makes sleeve easy to wear. Light weight material: enhances patient comfort. Comfort cooling: facilitates better patient compliance. Streamlined connector design: allows for a secure, quick and easy connection to the controller tubing. 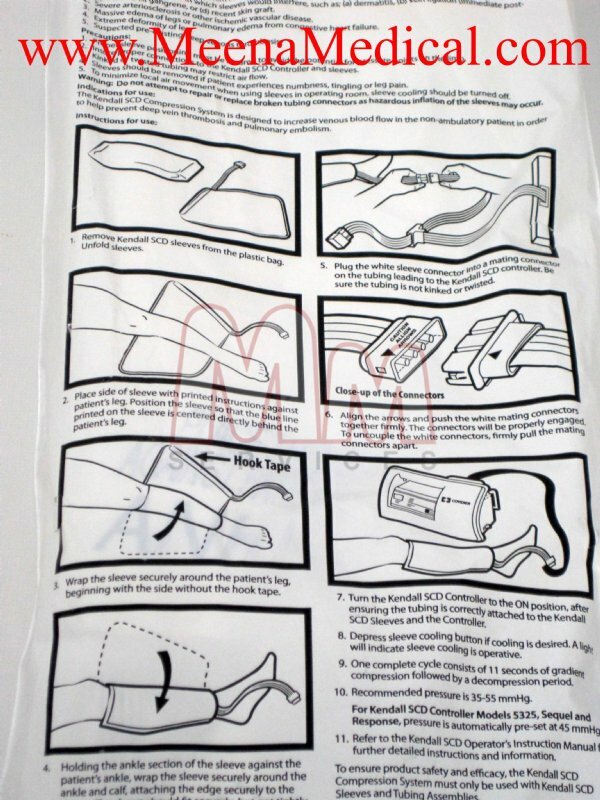 Latex-free: ensures patient and clinician safety. Compatible with Kendall's SCD Response Compression system with vascular refill detection: the system customizes the compression cycle with vascular refill detection to promote blood flow and help eliminate venous stasis. 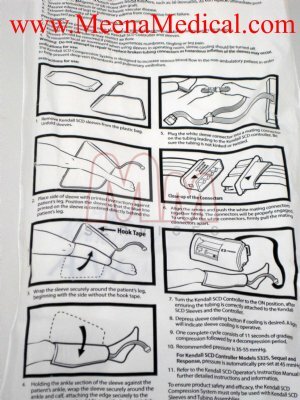 Clear labeling: ensures proper placement on the patient's leg.